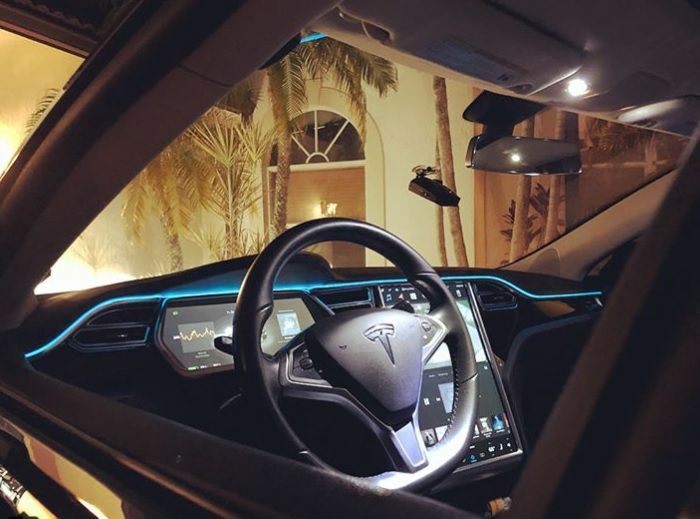 Today one of the members in Tesla Model S Owners Group on Facebook shared this picture of how he put premium ambient lighting in the interior of his Tesla Model S.
"If you haven't seen this, you can Turn your Model S into something out of Tron. It requires no wiring and can be completed for under $30. The kid is brilliant. He is going to put up a video tutorial tomorrow on Instagram of what to buy and show the community how to do it, wrote Eli Burton on Facebook, sharing the link to his Instagram with this picture above. Here is another looks at this Model S's interior ambient light. I think it's called EL Wire. it has lots of colors for your Model S interior and is a pretty cool stuff. It's even cooler in the dark. Light always shines in the dark. But there is an opposing opinion that it may mess up your car. If you want to know how to do this, keep an eye on this Instagram page I shared above. He wrote in the comments that he will post a how to video tomorrow. In the meantime, here is how to install interior LED strips to your door. Let us know please, in the comments section below if you have installed interior ambient lights in your Tesla and how you did it. This is my car!! Thanks for the article on me!